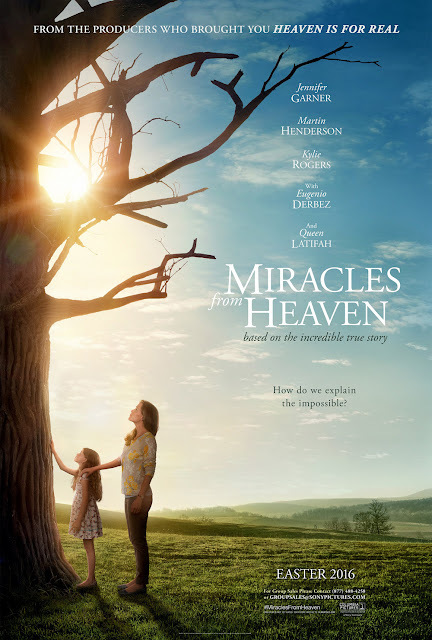 Columbia Pictures has shared the poster art for its faith-affirming, inspirational drama “Miracles from Heaven” starring Jennifer Garner, Martin Henderson and Queen Latifah. “Miracles from Heaven” is based on the incredible true story of the Beam family. When Christy (Jennifer Garner) discovers her 10-year-old daughter Anna (Kylie Rogers) has a rare, incurable disease, she becomes a ferocious advocate for her daughter’s healing as she searches for a solution. After Anna has a freak accident and falls three stories, a miracle unfolds in the wake of her dramatic rescue that leaves medical specialists mystified, her family restored and their community inspired. The film is directed by Patricia Riggen, from a screenplay by Randy Brown based on the book by Christy Beam.